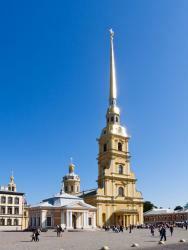 The foundation stone of the cathedral was laid in May 1712 in the centre of the Peter and Paul Fortress. The construction of the cathedral was started in the place of the dismounted wooden church. The wooden church was erected on Peter I’s order in 1703. It was consecrated in the name of apostles Peter and Paul. The building of the stone cathedral lasted for 21 years. It was designed by the famous architect Domenico Trezzini. In 1733 the construction of the cathedral was com­pleted. Domenico Trezzini himself directed the construc­tion work. The building started with the erection of a great bell-tower. Its construction was completed in 1723. The bell-tower consists of several tiers. The tiers are embellished with volutes. The bell-tower is crowned with a gilded spire. On the tip of the spire there are a ball, a cross and a weather-vane. The weather-vane is made in the form of a flying angel holding a cross. The figure of the angel was replaced three times, the last one in 2003. In the upper tier there is a chiming clock playing a melody. This clock was brought from Holland and mounted in 1776. The bell-tower of the Peter and Paul Cathedral is one of the symbols of St Petersburg. To the present day it has remained one of the tallest structures in the city. It’s 122.5 metres high. The cathedral was built in the style of Peter’s baroque. The building differs a lot from Russian Orthodox churches. It was designed in the form not of a cross but an elongated rectangle. 1726 by Ivan Zarudny. The icons on the iconostasis were painted by the master Pospelov. About forty skilled carv­ers, joiners and gilders took part in the creation of this masterpiece. After the construction the Peter and Paul Cathedral became the burial place of the members of the Ro­manovs Dynasty. In 1725 Peter the Great was buried there. Nearly all the emperors (except the tsars Peter II and Ivan VI) were buried there. Between 1896 and 1908 near the cathedral the building on the Grand Ducal Burial Vault was erected. It was intended for the burial of tsar’s family members. The new structure was connected with the Peter and Paul Cathedral with a roofed gallery. The famous architect Benois created the project of this building. There is mosaic on facades. The interior is faced with marble and decorated with gilded bronze. After the revolution of 1917 the Peter and Paul Ca­thedral was closed. In 1921 the museum was opened there. At the еnd of the 20th century it was returned to the believers. Now the services are held in the cathe­dral.